On the table there is a plate with food in it. Search it for a magnet. Now look under the table and you will find a photo camera. Take a picture of the room with the camera. Take the rope that controls the curtain and the hammer that is hidden in the curtain. Tap the surveillance camera in the corner and attach the picture you took. Use the hammer to take the two nails that are in the top bed. Use them to nail the photo to the surveillance camera, using the hammer. Use the hammer on the broom in the right corner, to take it's top part. Combine the broom stick with the rope and the magnet. Use the result to get the polisher. Now use the polisher on the grates in the ceiling, to reach the smoke alarm. Take the green bottle that's on the table in the right corner. On the bottom bed you will also find a dirty cloth. Combine the green bottle with the cloth, to make a molotov. Flip the bench and take the matches. Combine the matches with the molotv and use it on the fire alarm. The door will automatically open and you can escape from the cell. Escape the Prison Room is a game in which you are a prisoner and you need to find a way to get out of that prison. Escaping from the prison is not an easy task, and you will have to solve challenging puzzles in order to break free. Search each room carefuly for clues and items that will help you escape that area. If you can't solve Level 5 of "Escape the Prison Room" you can see the full walkthrough on this page. Escape the Prison Room Level 5 Answer, Cheats, Solution for Android, iPhone, iPad, iPod. Note: This is "Escape the Prison Room" by "lcmobileapp79"
Get the blue cup from the shelf, and the small chair that's under the table. Under the sheets you will find a key. Fill the cup with water from the barrel and dump it in the hole on the ground. Another key will rise on the water. Break the mirror on the right wall, with the chair, and take a piece of glass from the mirror. Use the glass to break the wall in the left corner. Inside there is a box locked with a code. The clue to open the box is on the bed frame. Open the box and take the third key. To find the order in which the keys must be used, tap on the music box near the door. Tap the red buttons in the order shown on the book that's on the table: "LEFT - RIGHT - RIGHT - LEFT - LEFT - LEFT - RIGHT". Now you will see the order in which the 3 keys have to be inserted: "GREEN - RED - YELLOW". Enter the keys in that order and the doors will open. Escape the Prison Room is a game in which you are a prisoner and you need to find a way to get out of that prison. Escaping from the prison is not an easy task, and you will have to solve challenging puzzles in order to break free. Search each room carefuly for clues and items that will help you escape that area. If you can't solve Level 4 of "Escape the Prison Room" you can see the full walkthrough on this page. Escape the Prison Room Level 4 Answer, Cheats, Solution for Android, iPhone, iPad, iPod. Look inside the book that's on the bottom bed. On the pillow there is another clue. Tap the shelf on the right wall and take the bowl. Empty the water in the toilet and place the bowl back to see the 3rd clue. Tap the pipe on the right wall and take the crowbar next to the red tap. Solve the puzzle above the toilet than use the crowbar on it to remove it from the wall. Take the scissors and enter the colors, in the order shown by the hints: YELLOW - RED - DARK GREEN - BLUE. Take the keys and use them to open the door. Escape the Prison Room is a game in which you are a prisoner and you need to find a way to get out of that prison. Escaping from the prison is not an easy task, and you will have to solve challenging puzzles in order to break free. Search each room carefuly for clues and items that will help you escape that area. If you can't solve Level 3 of "Escape the Prison Room" you can see the full walkthrough on this page. 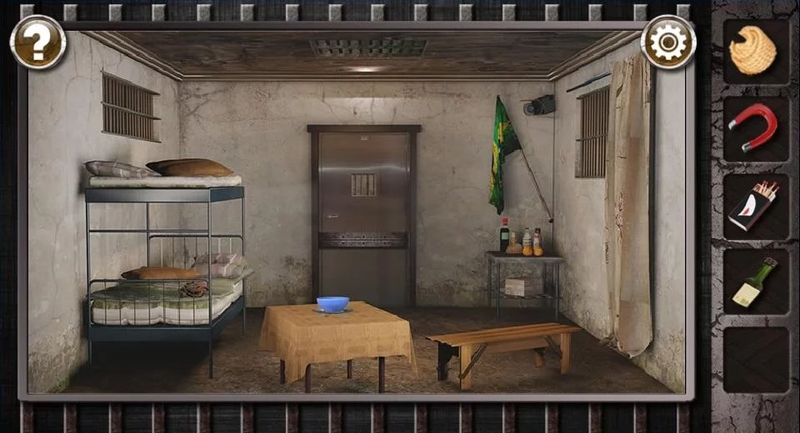 Escape the Prison Room Level 3 Answer, Cheats, Solution for Android, iPhone, iPad, iPod. Look under the left bed and take the item that's there. Now take the wire that is wrapped on the ladder that's on the left bed. You will find a handle on the bottom bed from the right, and a metal bar on the top bed. Take the dirty cloth that's on the bottom right bed. Combine the handle with the metal bar to make a screwdriver. Put the pipe into the hole near the cell door. Use the screwdriver to remove the bars that are in the left wall. Take the red tap and connect it to the pipe near the door. Turn the tap and a saw blade will come out. Combine the saw with the cloth and the wire. Now use the saw to cut the metal bars of the door, and escape. Escape the Prison Room is a game in which you are a prisoner and you need to find a way to get out of that prison. Escaping from the prison is not an easy task, and you will have to solve challenging puzzles in order to break free. Search each room carefuly for clues and items that will help you escape that area. If you can't solve Level 2 of "Escape the Prison Room" you can see the full walkthrough on this page. Escape the Prison Room Level 2 Answer, Cheats, Solution for Android, iPhone, iPad, iPod. Take the blue cloth from the left corner of the room and use it to clean the painting on the right wall, and reveal a black and white pattern. Tap the code panel above the bed and enter the pattern you found. Take the golden key and use it to unlock the weight that is locket on the bed. Tap the wall above the table and use the weight to break the wall. Remember the patters, than tap the door and enter the patterns on it to open the door. Escape the Prison Room is a game in which you are a prisoner and you need to find a way to get out of that prison. Escaping from the prison is not an easy task, and you will have to solve challenging puzzles in order to break free. Search each room carefuly for clues and items that will help you escape that area. If you can't solve Level 1 of "Escape the Prison Room" you can see the full walkthrough on this page. Escape the Prison Room Level 1 Answer, Cheats, Solution for Android, iPhone, iPad, iPod. Escape the Prison Room is a game in which you are a prisoner and you need to find a way to get out of that prison. Escaping from the prison is not an easy task, and you will have to solve challenging puzzles in order to break free. Search each room carefully for clues and items that will help you escape that area. If you can't solve on of the levels of "Escape the Prison Room" you can see the full walkthrough on this page. Chose below the level number to see what is the correct solution. 100 Doors Brain Teasers 1 is a puzzle game where you find yourself trapped in different rooms and you have to find a way to open the door and advance to the next level. If you are stuck at one of the levels just watch below to see how to solve level 46, 47, 48, 49 and 50. You will find a bottle opener under the rug on the floor. The box on the table has a bottle inside. Use the bottle opener to open the bottle. The cap of the bottle has a picture inside. Under the right pillow you will find a note that says: "You enjoy it". Break the window and you will see another note: "School off". Go to the code panel and enter; "HOLIDAY" to open the door. There is a hint on the door that says: "MR Steven's Villa". Inside the briefcase there is a hammer, use the hammer to break the small box and you will find a paper with patterns on it. The line that interest you is the purple line. The picture on the left has a number on it: "007". Tap on the code panel and move the purple hand to "7". When the name code appears enter: "07" and the door will open. Get the rope that is inside the red box. Use the rope to reach the lamp above the door, and you will see a hint: "700". Get the hammer that is on the bed and use it to break the wood board on the door. You will see now a new hint: +200. Do the math: 700 + 200 = 900. Tap the code panel and enter "900" to open the door. The cake box has a clue on it: "Marry". Inside the drawer you will find a hammer, use it on the Happy Birthday poster to revel a number: "14". Now tap the code panel and enter: 15 to open the door. Get the cushion on the sofa and the black bottle on the floor. Combine them and then use it on the picture to see the clue: "First alphabet is a number". Tap the tissue box to see the second clue: "Live long life". L = 12, the clue above the door says to put it in the equation "x-(y*z)". Tap the code panel and enter "132" to open the door. 100 Doors Brain Teasers 1 Level 46 47 48 49 50 Answer, Cheats, Solution for Android, iPhone, iPad, iPod. 100 Doors Brain Teasers 1 is a puzzle game where you find yourself trapped in different rooms and you have to find a way to open the door and advance to the next level. If you are stuck at one of the levels just watch below to see how to solve level 41, 42, 43, 44 and 45. In the cupboard you will find a pair of pliers, use them to unlock the hatch on the ground and get the 2 ropes that are inside. Combine the ropes and use them to reach the box that's above the cabinet. Pull the lever than observe how the animal pictures move. The hint on the door says "A to Z". So you have to put them in alphabetical order. Tap the code panel and enter "EGOZ". You will find a key under the bed sheets, use the key to open the cupboard. You will find a piece of paper inside that says: "Caught at 3:10". There is a hint on the wall. 1 hours counter clockwise, so you have to go back an hour. Tap the code panel and enter: "2:10". 100 Doors Brain Teasers 1 Level 41 42 43 44 45 Answer, Cheats, Solution for Android, iPhone, iPad, iPod.